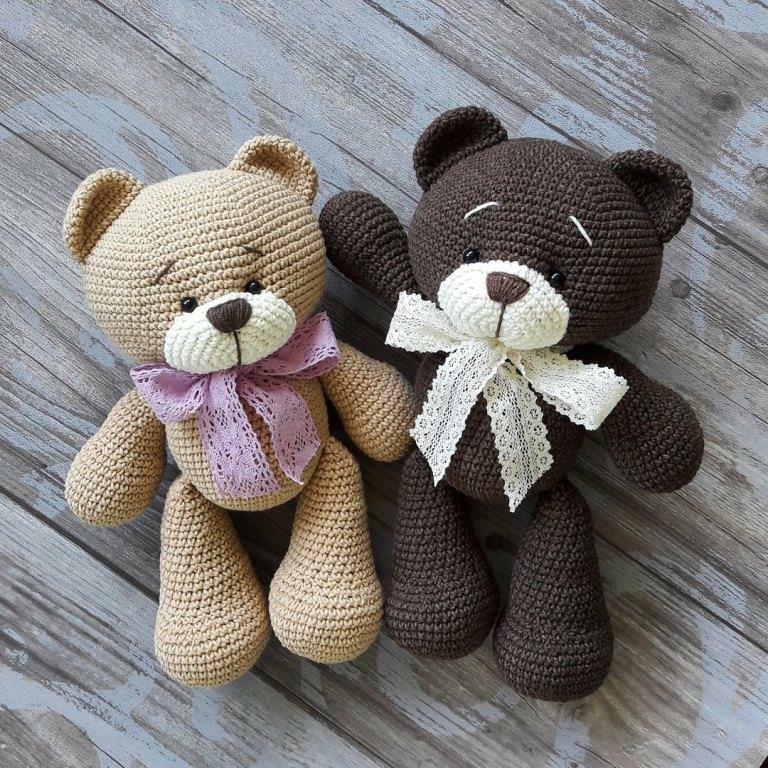 Crochet bear amigurumi. 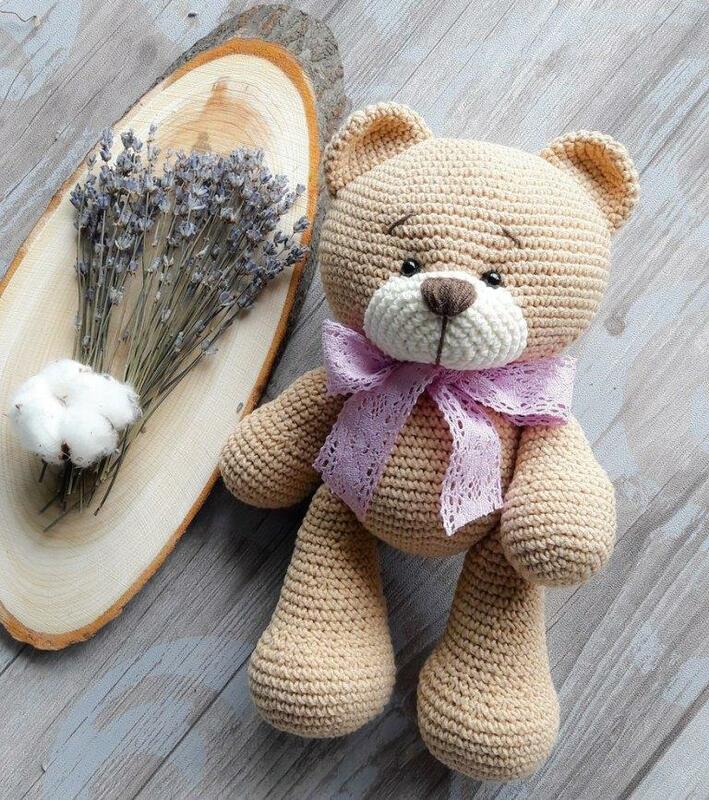 Crochet amigurumi bear pattern by Julia Deinega (Instagram: @deynega_yuly). p.s. : Thanks for wonderfull paterns! Dec, sc, dec, sc, dec, sc? I noticed Mari has written something different. Which is the correct way please? Anne, (dec, sc) *3 means: dec, sc, dec, sc, dec, sc. What size hook and yarn is used for this pattern? GRACIAS,HERMOSO,FELICITACIONES,SOY FELIZ CON TU PATRÓN,GRACIAS. Hola. Disculpa como pegaste el cuerpo a la cabeza. La parte que no se cerró va pegada a la cabeza ? O al revés Gracias. Wich material do i need? Yarn – YarnArt Jeans. Sorry, the designer didn’t say about hook size. Marie-Claude, you can crochet how you want. But the designer of this pattern leave 30 st for the head and 30 st for the body. Sorry, the designer didn’t say about hook size, yarn – YarnArt Jeans. bonjour, pour ne pas à avoir à coudre la tête, je commence mes amigurumis par le corps puis je prolonge la tête sur le même fils. en plus c’est plus solide qu’une couture car le corps et la tête sont d’un seul morceaux. je fais aussi les jambes et les bras avant comme ça, si je le peux, je les prends dans les tours du corps, du coup pas de couture et plus solide. Yarn: YarnArt Jeans. Sorry, the designer didn’t say about hook size. Can you please provide tips about the distance between the ears and muzzle. Also, how do you sew it on? Hola..de Argentina… El cuerpo es más chico que la cabeza?? ?le falta?? Hola! Quisiera impril patrón en papel porque es incómodo usar el ordenador para seguir las indicaciones. Además yo llevo el tejido a distintos sitio donde vaya. Cómo puedo imprimirlo? My bear came out beautifully. I used very thick wool and my bear is is huge and cuddly. How big does the teddy measure? Hola! No se puede traducir al español? Me encanta! Linda, sorry! There is no information about the row and distance for the eyes. How do you make the nose? Love the easy pattern, but the head is way to big! Can I cut it down in size some how? Just curious as to how did you alter the head size and body size? I’m wondering how big everyone’s finished Teddy’s measured out to be? Qual o tamanho deste urso? Where is the instructions to sew this bear together?! Verg, start to sew the muzzle on the line where is a head and a body is sewed. The designer doesn’t share with other instructions. Where do I put the eyes on? Which row?? Patricia, sorry! There is no information about the row and distance for the eyes. 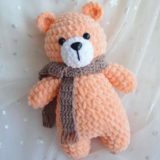 I have made several of these bears. I use a G hook and they are about 15″ long, 11″ when sitting. I added 2 more rows to the muzzle. I place the eyes in between rows 19-20 with about 10 stitches between the eyes. Thank you for the hook size and eye placement! How did you make the nose on the muzzle? ¡Hermoso! ¡Gracias por compartir! ¿Qué debo hacer para imprimirlo? Has anyone made the head smaller and the body bigger. I followed the pattern but I feel like the head is a bit too big for the body (although I love the look). The muzzle comes to the bottom of the head so I am thinking of ripping one or two rows. Can I get some feedback from those of you who have made this beautiful bear. I just love this guy! I’m in the process of making the bear and the first time I made the head it was gigantic! So I had to take the head apart and start over. This time around it’s much smaller but I’m worried that it’ll be too small to fit the body (which I already completed). The way I got the head smaller was to use a smaller hook size. I’m using a 4.5mm hook instead of the 5.5mm hook that my yarn suggested. Just a tip for those that are seeing their projects being way too big. Les explications concernant la queue de l’ourson me paraissent incomplètes, est-ce que je me trompe ? Wow… what a charming lady you are. Perhaps if the correct information was provide people wouldn’t feel the need to ask. But if your response to a simple question is to call people stupid. Then I suggest you keep your patterns to your self, or learn how to provide a full pattern. It’s not my pattern I just have enough intelligence to understand it unlike yourself. It’s not my anything I have never posted anything online. I just have enough intelligence to understand it unlike yourself. I completely agree! 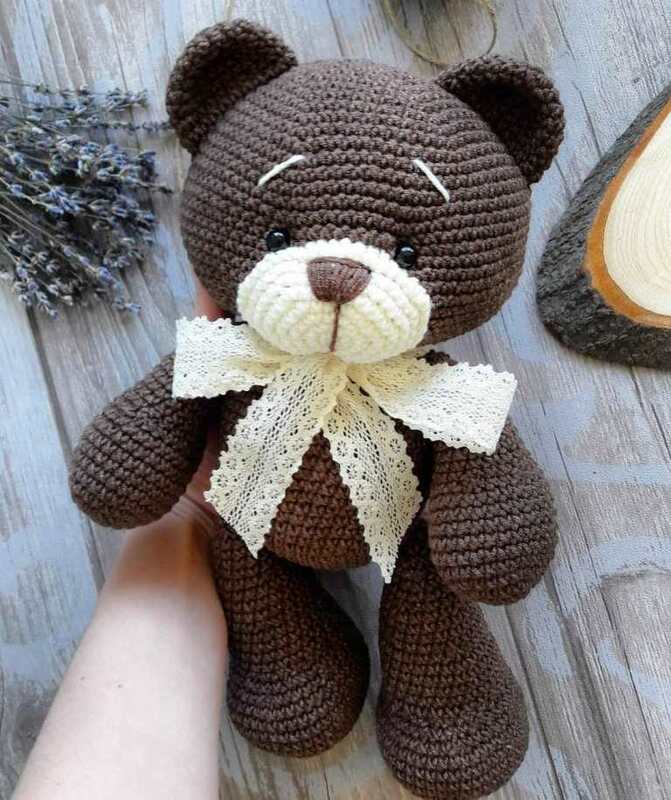 I have been searching for a good teddy pattern for a while now, and was very excited to start this one. However, after realizing there was critical BASIC information missing in the pattern such as hook size, yarn weight, assembly instructions…..I thought “Oh I’m sure this information must be answered in the comment section for sure.” And my fellow Hookers did not disappoint when they asked the same questions I was thinking. As I’m scrolling through the comments, still not finding the answers, I see it…”The reason it says…” and I think “oh this must be it…” HOLY SAINT PUNCTUATION BATMAN!!!!! Lady, your lack of BASIC English grammar, sentence structure, spelling, and crochet pattern knowledge hurts everyone of us physically! So I think I speak for all of us when I say…WOW! How much yarn is needed for this? can you please tell me in wich row do the eyes go, and how many stitches between? I have to place the eyes before I fill up the head! A Little tip: I made the Body upsidedown, starting wih the 30 stitches directly after the head, then I don`t have to saw the parts togeather. Help!! I really want to make this, but can’t find a way to download it. i can’t copy either, so really stuck!! RHODA, you can use a converter HTML to PDF online. Athena, the original pattern is free and the designer is Julia Deinega. 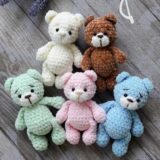 You can visit Instagram @deynega_yuly and see new photos of bears, crocheted with this pattern. buenas tardes.a que altura aproximadamente se colocan los ojos??? It doesn’t specify what size crochet hook to use. 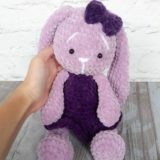 This pattern is being sold illegally on ETSY but I cannot post a link the site won’t let me. 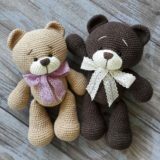 Search for Fashionisting shop and look for amigurumi bear pattern. She is charging GBP £3.89 for this design and making a lot of money from another’s design!!! !